The first time this budget analysis series ran was for the 2016 budget; and it becomes visible each day that the 1810 page document was a horrid, hurriedly-put, corrupt-conduit-filled piece of executive cluelessness. If you noticed, it is quite a change from the previous budget of change just like the government’s change mantra. Here are some quotes from the President’s speech on what when passed, will be arguably the most important document in the country - sorry, just checked and it is 63 paragraphs long so I will just skip to analysing the 2017 budget as we await the implementation report of the 2016 budget. We will begin with the State House budget, which is, 42,917,666,214. This almost double what the previous government budgeted for this in 2015 which was 23,465,865,117. 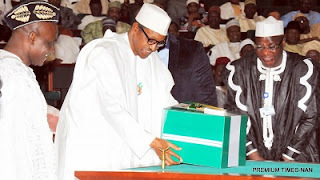 Out of this, 19,970,000,000 is the total capital budget while the total recurrent budget stands at 22,947,666,214. The total overhead is 10,171,082,268 and that for total personnel is 12,776,583,946. This is the first piece in the #SaatahBudgetSeries2017, and I will be looking at the budget of the State House (which was referred to as Presidency in previous budgets). There are 16 agencies under the State House, and they are: State House Headquarters, The Office of the President, The Office of the Vice President, Office of the Chief of Staff to the President, Office of the Chief Security Officer to the President, State House Medical Centre, State House Lagos Liaison Office, Office of the Senior Special Assistant to the President on Sustainable Development Goals (SDGS), National Institute for Policy and Strategic Studies (NIPSS). Kuru, Bureau of Public Enterprises, National Emergency Management Agency, Economic and Financial Crimes Commission, Bureau of Public Procurement, Nigeria Extractive Industries Transparency Initiative, Nigeria Atomic Energy Commission and its centres, and Office of the Chief Economic Adviser to the President which funny enough the President only appointed in August of this year. The first piece of poo I was hit with, ironically, was the “Sewage Charges” budget of the State House Headquarters” It was put at 52,827,800. That means 144,733 every day. That’s a lot of poo as far as the eye can see. Compare this with the “Sewage Charge” budget for 2015 which was 4,957,143 and for 2016 which was 6,121,643. This simply means the poo charge went up by 1050% compared with the 2015 budget, and 850% when compared with the 2016 budget. The 52,827,800 question I want to ask now is what exactly are they shitting there? The State House Headquarters budget for “Honorarium/Sitting Allowance” is 556,592,736. Let me remind you that the previous government budgeted 174,471,371 for same item in 2015, while in 2016, this administration jacked it up to 507,518, 861. The State House Headquarters still continues to budget for “Residential Rent.” This is something I have failed to understand up till now and I wouldn’t mind someone explaining it to me. That aside, the amount budgeted for this “Residential Rent” in 2015 was 22,459,575, while in 2016 it was put at 27,735,643. I don’t know how or why, but in the 2017 budget of “Recovery and Growth,” this same “Residential Rent” went up to 77,545,700. Whoever the Landlord of that State House Headquarters is, in this economy, he must be a very lucky and fortunate chap. There is an 8,539,200 budget for “Anti-Corruption” and I’m perplexed as to what exactly it is. The last time there was a budget for “Motor Vehicles” or anything like that was in the 2014 budget by the last administration and it was a total of 132,200,000. This government came in in 2016 and somehow concluded that the State House Headquarters did not have enough “Motor Vehicles,” so they started by budgeting 877,015,000 which was something like a 650% increase from the 2014 budget for the same item. The State House Headquarters still doesn’t think there are enough “Motor Vehicles,” so in 2017 they have budgeted a total of 197,000,000 for the purchase of “Motor Vehicles” and “Buses.” At this rate, by 2019, this government would’ve succeeded in buying enough “Motor Vehicles” to drive the entire country off the edge. 2016 will end up being one of the darkest years in this country in relation to power supply. So, I do not understand where the State House Headquarters got megawatts from in 2016 that they have now budgeted 319,625,753 for “Electricity Charge” in 2017. Just so you know, the “Electricity Charge” for 2016 was put at 45,332,433. The 2016 State House Headquarters budget for the “Rehabilitation/Repairs of Residential Buildings” was 642,568,122, while in 2017, I don’t know, but it looks like an enormous asteroid managed to hit and destroy the residential building at the State House Headquarters because what is budgeted for “Rehabilitation/Repairs of Residential Buildings” happens to be 5,625,752,757. As usual, knowing that we have travelling President, 739,487,784 has been budgeted for “International Travel & Transport.” Last year only the Vice President budgeted for books. This year neither the President nor his Vice budgeted for it. Apparently, they’re tired of reading. Just like in last year’s budget, the entire capital budget for the National Emergency Management Agency is for the “Construction of Office Building,” all 374,473,456 of it. The Economic and Financial Crimes Commission has budgeted 5,999,070,468 for the “Construction/Provision of Office Buildings.” In 2016 they spent 58,434,683 on that. If you do the math, that’s an increase of over 10,000% and qualifies as an economic and financial crime. The Economic and Financial Crimes Commission also budgeted 230,536,000 for “Legal Services.” I don’t know if this is enough, but since they say it is; and as long as none of that amount goes to the case-bumbling, Twitter SAN, Festus Keyamo, no wahala. In 2016 the EFCC budgeted 93,136,000 for “Motor Vehicles,” but since maybe the corruption they should be fighting has gotten faster, they have upped that to 455,000,000. So if you had a plan of running away from the EFCC, I am sorry, they will have almost half a billion Naira worth of cars to chase you with. It is a car race now you know. There a line item in the EFCC budget that mentions the “Procurement and Upgrade of Microsoft Product Licences” which 142,237,198 was set aside for. This is as vague as something can get, and when it comes to corruptly enriching yourself, being vague is the best bet. In 2016 3,260,000 was budgeted by the EFCC for the “Purchase of Photocopiers” while in the 2017 budget 13,755,000 is the magic number. 1,100,595,088 has been budgeted for the “Furnishing of the New Head Office” whose construction cost in the 2016 budget was put at 7,912,502,911. Now, guess what. There is a budget for the “Consultancy of the Head Office Project” and 244,727,624 is budgeted for it. I am sorry; you will have to guess what again. Let me not stress you, 4,583,616,838 is budgeted for the “Completion of Ongoing New Head Office Building Construction” which 7,912,502,911 was budgeted for in 2016, bringing the total to 12,496,119,749. For those of you that numbers scare, that is over twelve billion Naira for the construction of the EFCC new head office. If the budget for the “Furnishing” of same building is taken into consideration, it becomes almost fourteen billion Naira. That is the anti-corruption model; build a fourteen billion Naira edifice to scare corrupt individuals and firms. The Bureau of Public Procurement has budgeted 52,957,485 for “Defence Software” and I find myself wondering when they became the Ministry of Defence. But things change, just like this government wants us to believe. I wish them a happy defence. In the course of going through the 2107 budget, I noticed a significant change. There no longer existed a column to show the state of a project. Previous budgets had the “New” and “Ongoing” tags designated to line items, and it made it easier to understand or rather follow the money. We might not know, but that little omission, which I believe was on purpose, has the ability to make corrupt practices invisible. The 2017 budget is beginning to look more like a poo-storm, but that shouldn’t be a problem because as you saw from the beginning, they started by budgeting generously for it. We have come to the end of the first part of my budget analysis; hopefully the second part will have something better to offer us.